The drop in natural gas prices will reduce home heating costs by about $671 per home this year, according to the Energy Information Agency. NEW YORK (CNNMoney) -- Good news for homeowners: Natural gas prices are the lowest they've been in years. And they're expected to fall even further, thanks to growing production and slack demand. 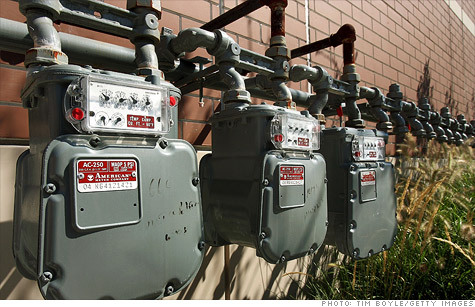 Natural gas is used to heat about half the homes in America, so that will mean lower energy bills for those households. They'll spend an average of $671 this year, according to the Energy Information Agency (EIA), about $50 less than last year. That compares to a whopping $2,383 for households that use oil heat. Natural gas prices closed Wednesday at a two-year low of $2.94 per million British thermal units (BTU). "We are starting the year with an incredible glut," Merrill Lynch researchers wrote in a note. "Prices may, in our view, have to temporarily drop below $2 per million BTU by October in order to curtail rampant production growth and create enough demand to avoid storage containment issues." Gas prices haven't been below $2 per million BTU since 2009. The drop has been staggering -- just four years ago, natural gas was over $15. In addition to consumers, the decline is great for industries -- such as plastics makers -- that rely on natural gas, and manufacturers that rely on gas for inexpensive electricity. But these low prices are painful for oil and natural gas companies, as well as for those that produce wind and solar energy, since renewable energy sources must compete at these prices in electricity generation, another main use for natural gas. Prices should move higher in the second half of 2012, assuming that the U.S. economy improves, but they'll remain historically low. Last week, Deutsche Bank reduced its full year 2012 natural gas price forecast from $4.25 to $3.50, citing strong supply and low demand. On Tuesday Merrill Lynch cut its full year 2012 gas price forecast from $4.30 per million BTU to $3.30. Unusually warm weather has limited the demand for natural gas as a heating source, while the weak economy has hurt industrial demand. But a major culprit in the oversupply of natural gas is the surge in production in the United States over the last few years. The boom is the result of new drilling technology and the widespread use of hydraulic fracturing -- a controversial practice known as fracking. The process, which uses water, pressure and chemicals to crack shale rock and unleash gas, has also spawned fears over ground water contamination. Thanks to these advances, natural gas production has increased nearly 30% since 2005, according to EIA. Also driving production is a flood of new foreign investment, as well as the need for energy firms to earn back the billions that they've invested in land leases. Indeed, EIA is expecting another 3% increase in production in the next two years alone -- which should keep prices low for a while.